Histological techniques. 5. Immunohistochemistry. Atlas of plant and animal histology. Immunohistochemistry is a technique for studying the tissular location of particular molecules by using antibodies. In the last decades, it has become a common histological procedure boosted by the availability of a wide variety of commercial antibodies and the standardization of the protocol. It is an easy, fast and very powerful technique that relies on the high affinity and specificity of the antibody-antigen reaction. To visualized the antibody-antigen reaction, antibodies are conjugated or combined with enzymes or fluorescent molecules that amplify enormously the detection threshold. Antibodies used in immunohistochemistry are G type immunoglobulins, produced by B lymphocytes of the immune system. There is a massive production of G immunoglobulins when an animal is inoculated with a molecule that is recognized as strange by the immune system. These immunoglobulins are released and found in the blood, from where they are later purified and used for immunohistochemistry. Complex molecules like proteins may have several antigenic determinant sites, that is, molecular domains capable of starting an immune response. An antigenic determinant activates a B lymphocyte clone, or lineage, that produces the same type of G immunoglobulin against that molecular domain. Immunoglobulins from all activated B lymphocyte clones after the injection of a complex molecule are found in the blood serum. A polyclonal antibody is the purified serum containing the immunoglobulins from all the activated B lymphocyte clones (Figure 1). On the other hand, individual activated clones can be extracted from the animal body and cultured in vitro. Each colony of each single in vitro culture contain B lymphocytes that produce the same G immunoglobulin, which recognizes one antigen determinant of the injected molecule. The supernatant of each culture can be purified, which is therefore known as monoclonal antibody. Figure 1. 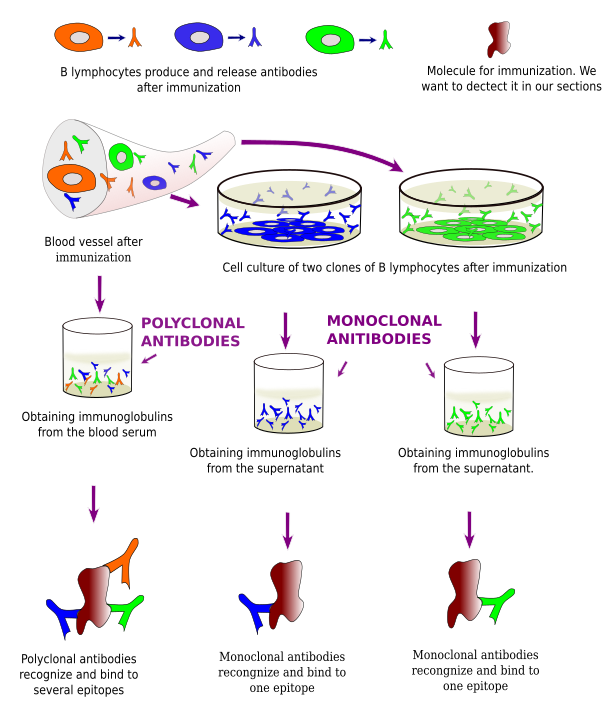 Obtaining polyclonal and monoclonal antibodies. G immunoglobulins have two molecular domains or regions: variable and crystallizable. The variable region (Fab) is responsible for recognizing the antigenic determinant, or epitope, in the foreign molecule. Each G immunoglobulin molecule has two equal variable domains, i.e., they recognize the same antigenic determinant, so that each single G immunoglobulin may bind two foreign molecules at the same time. Crystallizable regions are similar for all G immunoglobulins produced by individuals of the same species. If the epitope is modified, the antigen-antibody reaction will be weak or not happening at all because the antibody is not able to recognize the epitope. Thus, the fixative and fixation method have to be chosen carefully to preserve the features of the epitope in the tissue. Thus, different fixatives are used depending on the nature of molecule to be detected. In addition, embedding may add damages to epitopes; for example, paraffin embedding is not recommended for the detection of some molecules because dehydration and heat harm the antigen-antibody reaction. The best preservation for most epitopes is achieved in frozen and vibratome sections, after a proper fixation. 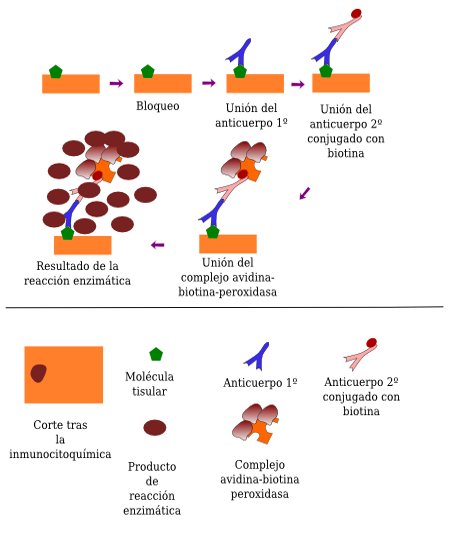 Immunoglobulins are molecules that cannot be visualized with a light microscope, Therefore, they must be conjugated (bound) to other molecules that help in visualizing the antigen-antibody reaction (Figure 2). There are two types of molecules that are usually conjugated with antibodies: fluorescent molecules and enzymes. Fluorescent molecules can be directly visualized with fluorescent microscopes and the enzyme activity produces colored and insoluble products that can be observed at light microscopy. In both cases, the signal (what we can observe) are located where the antigen-antibody reaction occurred. Direct immunohistochemistry means that the primary antibody is conjugated with a label molecule, either an enzyme or a fluorescent molecule. Nowadays, indirect immnunohistochemistry is more common. 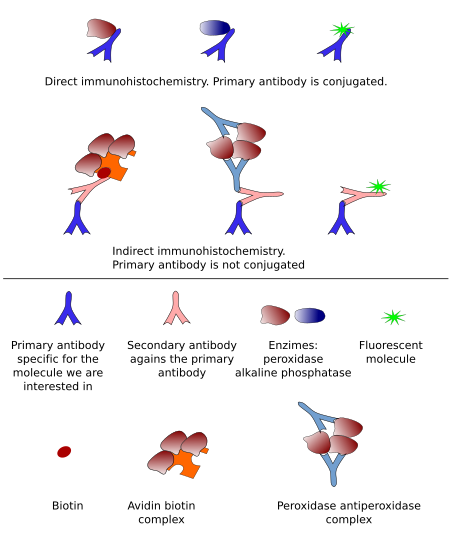 It means that the primary antibody is not conjugated with any molecule and there are other molecules between the primary antibody and the label molelule (Figure 2). Figure 2. Detection methods for antigen-antibody reaction. Immunodetection based on enzyme activity is known as immunohistochemistry, or immunocytochemistry. It uses enzymes that produces permanent labeling after dehydration and coverslipping the sections. The most common enzymes used in immunohistochemistry are horseradish peroxidase and alkaline phosphatase. Direct immunohistochemistry was developed first, and later it came the peroxidase-anti-peroxidase indirect method (Figures 2). Nowadays, biotin-conjugated secondary antibody combined with avidin-biotin-peroxidase or streptavidine-peroxidase is the most common method (Figures 3 nad 4). Indirect methods provide higher versatility and more sensitivity (more signal for an amount of epitopes). Figure 3. Immunohistochemistry for tyrosine hydroxylase. Indirect immunohistochemistry developed with horseradish peroxidase enzyme activity. Figure 4. Indirect immunohistochemistry developed with persoxidase activity. Immunofluorescence uses fluorochrome-conjugated immunoglobulins (Figures 5 and 6). It has a number of advantages and some drawbacks. It takes advantage of fluorochromes, molecules that emit visible light when stimulated with a specific light wavelength. Although immunofluorescence can be used to study just one molecule, its real power is for detecting multiple molecules in the same cells or tissues, that is, co-localization of molecules. It is possible because different fluorochromes are excited in particular wavelength ranges so that two or more fluorochromes can be specifically excited by using a set of filters that let pass selected wavelength intervals. Pictures can be taken after excitation with each wavelength and the images are overlapped to study if an immunopositive structure, for example a cell, is labeled in more than one image, which means that there is co-localization. Immunofluorescence has some drawbacks, such as not being a permanent labeling because the visible light emitted by fluorescent molecule fade away with time. Figure 5. Immunofluorescence with double detection by using mouse anti-calbindin (on the left) and rabbit anti-parvalbumin (on the right) primary antibodies in brain sections. 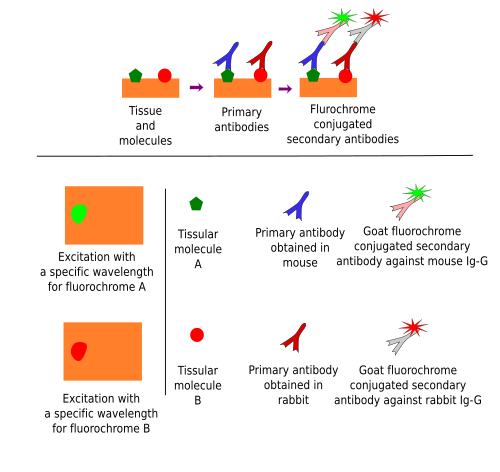 Secondary antibodies were conjugated with fluorescein (anti-IgG-mouse-fluorescein; on the left) and with Texas-red (goat anti-IgG-rabbit-Texas red; on the right). 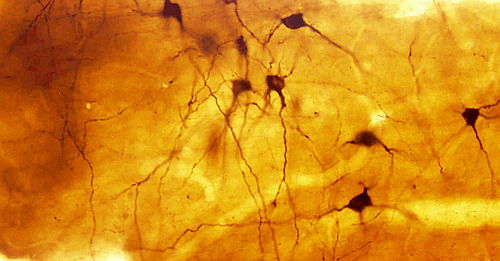 Neuronal somata and nerve processes can be observed. Withe arrows indicate neurons that express both, calbindin and parvalbumin. Blue arrows indicate neurons expressing only parvalbumin. The dark areas of the image are immunonegative. Figure 6. Co-localization of two molecules by immunofluorescence. The primary antibodies need to be from different species because fluorescent-conjugated secondary antibodies have to specifically recognize them.